HANCEVILLE, ALA. – Wallace State Community College will welcome former Auburn University and NFL punter Lewis Colbert to campus on Oct. 21 at 11 a.m. at the James C. Bailey Auditorium. 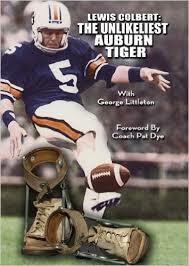 Colbert, an All-American for Auburn in 1985, is the author of “Lewis Colbert: The Unlikeliest Tiger,” which was published in 2011. He carved out a successful college punting career and played in the NFL despite overcoming odds with a club foot and a challenging childhood. Colbert’s visit will be sponsored by the Wallace State Diversity Committee. Colbert, who initially arrived at Auburn as a walk-on, played for the Tigers from 1982-85 under Hall of Fame coach Pat Dye and is considered one of the best punters in school history. Colbert, 52, was a first-team All-American selection by Kodak in 1985, the same season he boomed a 77-yard punt against Southwest Louisiana. His 45.8 punting yard average in 1985 is still second-best in Auburn history, and he maintains the most career punting yards for the Tigers (10,179 yards; 41.7 avg.). The Kansas City Chiefs selected Colbert in the 8th round of the 1986 NFL Draft, and the Phenix City native played two seasons with the Chiefs and one with the San Diego Chargers. He punted 117 times for a 40-yard average in the NFL. Since 1987, Auburn has recognized the top special teams player at its annual A-Day game with the Lewis Colbert specialty MVP award. Colbert currently lives in Georgia.